Please refer to our stock # 615 when inquiring. 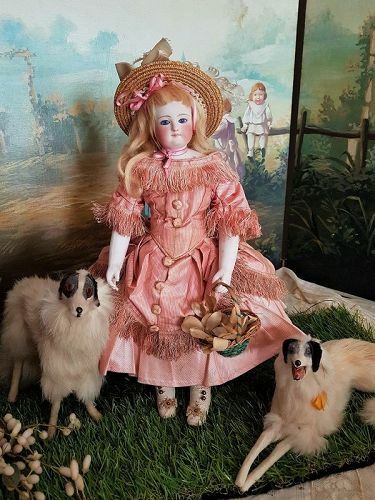 Outstanding rare Fashionable teen poupee .... circa 1875 ... with very beautiful face gentle expression , has lovely quality pale bisque and beautiful painting , original body and wearing pretty enfantine costume !! The little Mademoiselle is circa 13" ( 34 cm ) and an stunning all original rare poupee with pale bisque swivel head on kid-edged bisque shoulder plate , full cheeks and almond shaped blue glass inset eyes , thick dark eyeliner , very fine painted lashes and arched feathered brows . Closed mouth with outlined lips and inside the head pierced flat ears. Pretty blonde mohair wig over cork pate . Original sturdy early V - shaped kid poupee body with fine modeled bisque arms to above the elbows . Has well modeled fingers and fine painted nails . Has shapely torso , dowel-jointing at shoulders , gusset jointing at hips and knees . Generally excellent condition , best quality of bisque head which is free of damage , repair , hairline or chip !! Note three micro tiny factory flaw fire lines at neck of her shoulder plate , very hard to see and not disturbing. Has very fine hairline at her right upper bisque arm.... please see picture and she has at left bisque hand one repaired finger and at her right hand she has three finger tip repaired...... please ask about special pictures . Her kid boyd has some patches , please note my pictures !! Mademoiselle wearing in her wonderful pink silk enfantine costume with silk fray decoration . Summer straw hat and fine cotton set of under garment , stocking and lovely leather booties !! Gentle and rare Teen Fashion Doll in perfect cabinet size ... ready to display and a treasure for each collection !! Please let me know if you have any question or if you need more or special pictures . Layaway are always welcome, feel free and ask about it . Thank you for your interest on my Doll-Shop !! !